The guest editor for this Alliance special feature is Alejandro Litovsky, Director of Pathways to Scale at Volans. Traditionally, growing bigger has been seen as a mark of success, but should size really be the main aim for all charitable projects? We should think creatively, says Litovsky, and focus on improving the infrastructure for collaboration to achieve maximum impact. The feature includes interviews with Virgin’s Richard Branson and Skype founder Niklas Zennström, both of whom are now applying their experience of growing businesses to develop new philanthropic ventures; Gates Foundation CEO Jeff Raikes, who argues that partnerships are key to building large-scale change; and theoretical physicist Geoffrey West, who examines how universal scaling laws found in nature can be applied to philanthropy. Case studies from around the world tell the stories of initiatives that have achieved a remarkable impact, including a global sustainable transport initiative, a waste pickers’ movement in Brazil and a citizen media initiative in Tanzania. 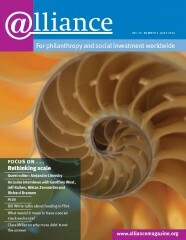 The June issue of Alliance also includes news of a proposed social stock exchange for the UK, an interview with Bill White of the Mott Foundation, and further articles, reviews, conference reports and global updates. Investors’ Perspectives – Is more debt the answer? Can crowdsourcing solve development problems? Why continue the hero worship?